Life is hard. Is that too blunt to say? Life not only is hard–but it is terribly wicked, cold, and futile. That is not to say that life is not also wonderful, beautiful, and gracious to us–as Christians Christ promised us trials and tribulations as well as the joy of the Spirit–but as we all continue to run this race towards the final goal, that is, Jesus Christ and our ultimate glorification, one can certainly see how the trials of this life can weigh us down throughout this process which seems like an eternity, albeit it is but a breath. Sensing the critique: I understand that Christ takes our burdens, that His yoke is light. Moreover, I understand the eternal hope and joy we have in the Spirit. Notwithstanding, I would be kidding myself if I convinced the world that I ran around “happy” twenty-four/seven. To the contrary, as moot as many Christians might take this statement: I am a pessimist. To clarify, I am not saying that I am a pessimist in the metaphysical sense; namely, one whose soteriological view of the world is one of hopelessness, i.e. Schopenhauer, et al. To clarify further, we must make sure not to confuse pessimism with cynicism–which I loathe, and am far from–or negativity, which is contrary to our biblical mandate. Rather, I am saying that in my day-to-day life, although I am constantly filled with joy of the Lord–and have numerous amicable friendships wherein co-workers, family, and friends praise my character and admit that they just love being around me and spending time with me due to my encouraging attitude and amiable candor–I tend to see situations in a more bleak light, in especially concerning future events. This is true of the future for me personally, and also, the future of global events eschatologically. Even still, all of the aforementioned is not disheartening to me in the least–to the contrary. I feed off of this most times, as my introverted personality, and tenancy to emotionalize everything, squared right in with this sort of poignant pessimism. 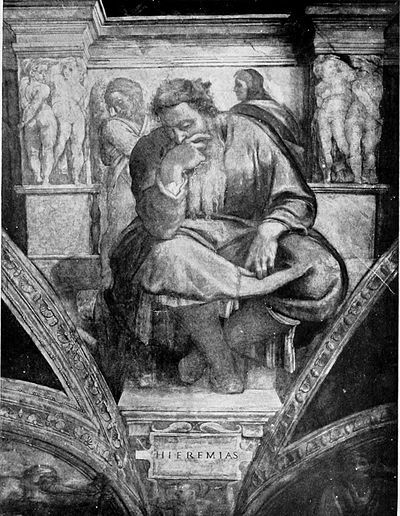 In fact, although I certainly feed off of my experiences, and especially am encouraged when I can relate such and such experiences with others who have gone before me–such as Søren Kierkegaard, Fyodor Dostoyevsky, Friedrich Nietzsche, et al.–I find much comfort in the writings of the prophets, who were often melancholy in their demeanor; misunderstood by the masses; and despondent and alone. The struggles, trials, and hardships they faced were real, inasmuch as the struggles hardships, and trials we face are real. Throughout them all, God hears us, He knows what we experience existentially; yea, even the Son of God, who put on human flesh.